Herbfarmacy are one of the most well-known organic skincare brands certified by the Soil Association - and for good reason too! Not only are their products handmade in small batches, the product range also utilises the freshest, most potent organic herbs which are grown and handpicked at their own farm in Herefordshire (here in the UK). The little postcard you can just about see in the bottom corner of the photo above shows their calendula field looking vibrant in full bloom - you have to take a look at the gallery of the farm on their website showing all the amazing herbs! I just love the ethos and passion behind this brand and I'm so glad to have had the chance to test out a selection of Herbfarmacy products* over the past few weeks! This intensely moisturising 100% organic multi-tasking balm is the ultimate saviour for dry skin. The formula is incredibly rich and concentrated, so you only need to use the smallest amount to reap the benefits. It includes marshmallow, mullein, jojoba and shea butter to soften, smooth and protect the skin and the balm is also said to be great for combatting fine lines. I love using this at nighttime on any dry patches and waking up in the morning with the smoothest, baby soft skin! I think I'll be getting a lot of use out of this product in the upcoming cold winter months! I can be difficult to please when it comes to lip balms but this one does the job really well! It's 100% organic, containing their signature ingredient marshmallow, as well as sunflower oil, beeswax and cocoa butter to condition and hydrate. This is my current favourite lip balm to use overnight as it works so well to keep lips from drying out and I like the subtle scent too. I was intrigued to try this cleanser because of the name, but I would actually describe it more as a cream than a mousse! This product is 80% organic and contains a very small percentage of synthetic preservatives, although this doesn't particularly concern me since it's a wash-off product. I like to massage this into dry skin and buff away with a muslin cloth or flannel. It works really well to remove makeup or works well as the second step in a double cleanse. This is also a lovely gentle cleanser to use in the morning, leaving my skin feeling clean and refreshed. Body oils are still quite a "new" concept for me as I'm much more used to creams and lotions. This body oil is 95% organic and contains marshmallow, calendula, evening primrose, hempseed and vitamin E oils to nourish and moisturise the skin. It has a distinctive herbal scent that I find quite calming so I like to use this for a relaxing weekend pamper! The oil absorbs into the skin easily (always a positive in my book!) and leaves the skin feeling soft and smooth. It's ideal for dry skin and is also said to be great for stretch marks and scars. I've also been testing a few mini samples from the range and I've particularly enjoyed using the Exfoliating Cleanser which contains jojoba beads to gently exfoliate. I can definitely see myself repurchasing the Mallow Beauty Balm every winter and the Lip Conditioner too! 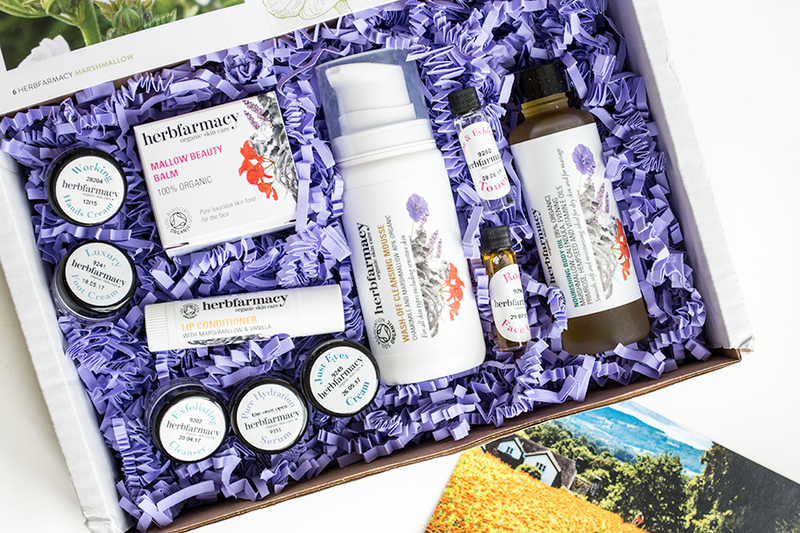 Herbfarmacy are such a lovely organic skincare brand and their product range is really worth checking out for yourself! You can find these products direct from Herbfarmacy or at various stockists including LoveLula. Have you tried any skincare from Herbfarmacy before? Thanks for sharing, I look forward to trying this brand! I also recommend checking out Beausoleil Organics and their new line of products. I am currently a beauty blogger for this startup company and they have some wonderful cosmetics to try! These all sound wonderful. I'm definitely eyeing the Wash-Off Cleansing Mousse.